When you start building your online brand, your biggest goal is to increase your visibility. You want people to be able to easily find you online. You want Google searches that include your name to lead back to you. The more time you spend working on personal online branding, the more your emphasis is going to shift to maintaining your image. Once you reach a point at which your brand is visible online, you have two priorities. First, you need to make sure that you stay visible online, and that you continue to dominate search results for your name. Second, you need to monitor those search results and make sure that they all impact your brand in a positive fashion. What happens when something negative does show up in your Google search results? The answer is the next big segment of online reputation management. Google search results matter, and what people see when they look you up online has significance for your future. The first page of results under your Google search can influence the way people perceive you, from employers to colleagues to friends. Positive results can boost your chances of landing a job, assist you in growing your social media following, and accelerate your rise to becoming a trusted authority in your field. Negative results can undo all your hard work. Negative search results on Google can take a lot of different forms. Articles or blogs that portray you in a not-so-flattering light are the most common pieces of negative content that tend to show up in Google search results. The more visible you become in your career, the more likely you are to be the subject of negative content on the internet. Such is the curse of building a recognizable online brand. The costs of these negative search results will vary dramatically depending on multiple different factors. For instance, a piece of negative content that makes it to the front page of your Google search is going to hurt you much more than something that stalls out on page two or three. Precisely how damning the content is will also matter. For instance, an article that quotes you out of context and makes you seem rude or dismissive won’t help your online image, but it won’t hurt it like a blog post that explicitly accuses you of a crime will. The consequences of negative Google search results will vary depending on who is looking. If a damning piece of content shows up on the web right when you are in the middle of a job search, it could affect your ability to find a job. If you already have stable employment, the content might not affect you as much—at least not immediately. As a rule, you should never ignore negative content, even if it doesn’t completely drag your name through the mud and even if you don’t think it can hurt you. A reputation is a fragile thing. In the echo chamber that is the internet, that statement is especially true. Every negative piece of content—no matter how minor it may seem at first—can weaken your defenses and tarnish your image. Eventually, even minor blemishes on your reputation can have major consequences. Stay calm: When your phone dings with a Google Alert and you see that it relates to a negative post about you, your first reaction will probably be to lose your cool. Particularly if you aren’t used to facing criticism or being degraded publicly in any way, it can feel invasive and uncomfortable to experience negative coverage for the first time. Don’t panic: negative search results happen, and there are ways to deal with them. Panicking, getting angry, shooting out rage-fueled tweets to refute the search results, or sending threatening emails to whoever posted the content are all actions that won’t help. Posting about the content on social media only draws attention to it, and getting confrontational with the poster just gives that person more ammunition to use against you. Take a deep breath and spend a moment composing yourself: it will help you to be calm and collected as you work through the process of doing damage control. Assess the source: Where is the negative search result coming from? In most cases, content that hurts your online reputation is going to come from external sources. However, there is always a chance that the negative content relates back to something you control, like a social media account or an online forum account. If you do control the content in question, simply login to the relevant account and delete the post. If the source is a website, blog, or publication that you don’t own, you will have a more complicated road to remediation. Contact the owner or manager of the site where the content is posted: There is always a chance that website managers will by sympathetic to your online reputation issues. As such, it’s always worthwhile to reach out to the owner of the site where the negative content about you is posted. Send an email and calmly frame your reasoning for why the content should be removed. Whether the post misquotes you, portrays you in a misleading light, or is outdated—if it highlights a criminal conviction that you’ve had expunged, for instance—you might make a good case for removal. This path is certainly easier than other options, so it’s worth the time to try it. Go to the next level: If you go right to the source of the content and the site manager refuses to remove it, you might be able to get help by going to the next level: Google itself. Google won’t often remove search results but will consider the notion in extreme cases. If someone posts your address and contact information online without your consent, for instance, you can argue to Google that the public posting of that information threatens your safety. Google will also remove content that shares sensitive information that might lead to identity theft, such as credit card numbers and social security numbers. If the content in question is inaccurate or libelous, then you might be better off seeking legal assistance. Bury it: If you can’t get the negative content removed from the internet, your next best option is to bury it. For this step, double down on the tactics you used to establish a positive and visible online brand in the first place: create more social media profiles; be more active on your existing social accounts; start blogging more frequently, and hire a reputation management firm to create positive content about you and your personal brand; link to blog posts and articles on social media; link to your other social media accounts on social media; create a personal website if you haven’t done so already; and start posting on forums and in comment sections using your own name. All these strategies will help you to drown out negative content. Finally, keep an eye on those Google Alerts: if more negative content is coming, you need to be ready for it. In a perfect world, you would never have to deal with negative content about yourself. 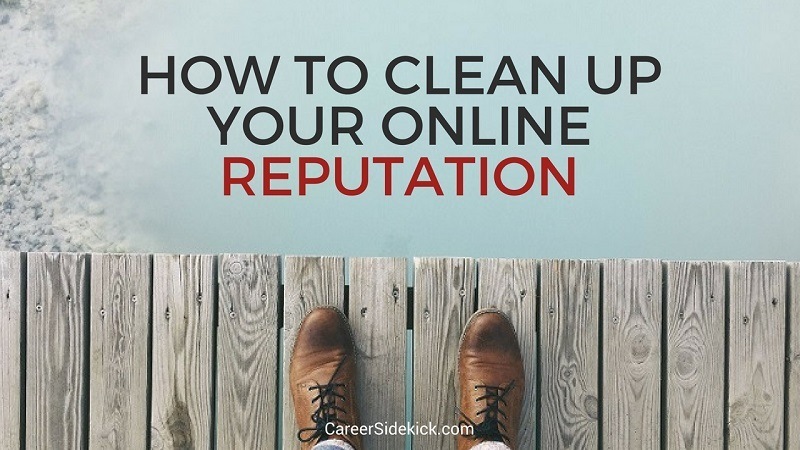 However, part of being a well-known professional in your field is dealing with controversy and backlash, and controversy and backlash breed negative online content. It’s how you respond to these negative posts and news stories that will define your online reputation—not the content of the posts and news stories themselves. Michael Klazema has been developing products for employment screening and improving online customer experiences in the background screening industry since 2009. He is the lead author and editor for Backgroundchecks.com. He lives in Dallas, TX with his family and enjoys the rich culinary histories of various old and new world countries.